Before starting with the profile for today, I wanted to mention some MTG news that has been happening in Nagoya, Japan as of late. It’s come to my attention that many of the Hobby Shops have been experiencing shortages of cards as of late, and thus the price of boosters has risen. Boosters of Scars of Mirrodin and Mirrodin Besieged have risen anywhere from 400-500 yen a pack in most places ($5.10-$6.40). Some places are experiencing shortages in the other boosters as well, but not to such an extent. Most M12, New Phyrexia, and Innistrad are still going for their usual prices of 350 yen, but some stores have raised the price to 380 yen ($4.80). How long this shortage will last, and how this will affect the rate of single cards in the area is yet to be seen, but it doesn’t bode well in the long-term. Mom and Pop stores aren’t dead, they are just located in out-of-the-way places, waiting for you to find them. Toy and Hobby Shop near the Ozone area in Nagoya. This place really is a gem. In a previous post I talked about my first experiences buying Magic cards back in the USA in a mom and pop store. This place makes me feel nostalgic for those times. It also brings a lot of unique and different ideas to the Magic/Hobby shop idea in Japan. Most places you go are largely run as businesses. When you want to sell a card the business gives you a certain amount of money, usually about 30-40% of the price and then they turn around and sell it at 2-3 times the price and make a huge profit. This is not the case with Mishimaya. consignment shop. 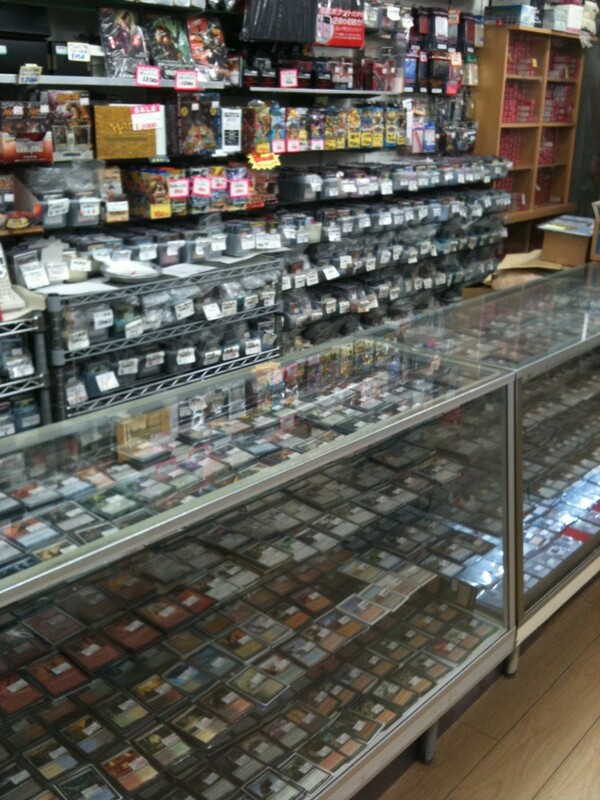 A customer can come in and put his cards up for sale at any price (minimum 50 yen). He can sell commons, uncommons, rares, anything. And you can also sell as many copies of the card as you want as well. Some people were selling 1 card for 53 yen, others were selling 2 or 3 for the same price, and sometimes you’ll even see 4 cards for 53 yen (especially cheap for the more popular commons and uncommons out there)! A great deal, and probably THE BEST DEAL ON SINGLE CARDS in the city. If you are looking for single cards, this is the place to go. Players set the price, not the store. If you set a good price, the card will sell very quickly and you’ll probably earn more cash than you would selling it outright at another MTG shop. The draw back of course is that you don’t get the money right away. You have to wait for it to sell. Also I want to let you know that the shop owner will keep 20% of the sale price for selling it at his store, and the player will get 80% of the sale price. Keep this in mind when you set the price for the card(s). The shop also sells booster packs of recent sets, and their prices are very competitive. As of yesterday, the prices seemed unchanged by the shortage MTG players have been experiencing this December, and most packs are around the 350 yen price range. There are also MTG events every week, ranging from Legacy, Modern, to Standard tournaments. I believe the price is 500 yen for these events, though I can’t say how many people show up. However, it seemed like the store had some very loyal customers when I was there, and the owner also said that the store was usually very busy. I’m going to guess that they usually have good numbers of people for these events, and they also have Friday Night Magic every week too. For dates and times, check out Wizards of the Coast’s website and look at their Event Locator for Nagoya. Look for the only dot up near Ozone (northeast of the downtown area). You’re probably wondering how to get there by now, so let me do my best to give directions to the place. Please be aware that they are CLOSED ON MONDAYS! There are actually 3 ways you can get here. The first one is the JR Chuo line from Nagoya station. It’s a straight, 190 yen ride from the station to Ozone. The next way is taking the Meitetsu-Seto line. I can’t say how much it is since I’ve never ridden it before, but if you live near this train line, you can get to Ozone by Meitetsu as well. The final way to get here is by subway. Just as before, you can take the Higashiyama (Yellow line) from Nagoya to Sakae station, then transfer to the Meijo (Purple Line) and head clock-wise towards Ozone (about 15 minutes there?). Once you arrive at the station, you’re going to head towards Ozone Avenue (If you’re coming from the subway, look for exit E6 which is where all underground shops are near Ozone station). Don’t be confused by the regular exits which are just numbers by themselves (sans the “E”). I believe this is the side closest to the Meitetsu line and Subway. The other side of the station is the JR Yuritomo(sp?) line and heads towards Nagoya Dome. That is NOT the way you want to go. As I said, look for a sign that says Ozone Avenue and you’ll see a little shopping street with restaurants and stores. To get there from the station JR/Meitetsu, you have to take the escalator down to the underground shopping area. Just like the subways directions, look for exit E6 and walk up those stairs to Ozone Avenue. After walking down that street for a few minutes, you’ll see a TOY&HOBBY store front on the left corner. This is Mishimaya! If you need further directions, please contact me and I’ll be happy to help you find the place. Thanks again for reading and I hope you check out my next feature which will probably be posted sometime after the winter holidays when I return to Japan on 12/30. Happy holidays! Are you still in Japan? I am in Kariya on business trip and would very much like to visit the Mishomaya toy and hobby store you recommended. I was wondering if you might be able to help with directions? I have ventured out to Nagoya twice via subway but I am not very familiar with the different routes. Yep, not leaving any time soon. If you’re free on Tuesday evenings, a lot of us foreign MTG players get together at Mishimaya. You can the JR line to Kanayama station from Kariya, then take the local Chuo line from there to Ozone (about 3-4 stops?). Head out the main entrance and walk towards Ozone Avenue (it can be reached by taking the escalators down, which are located on the left past the convenience store). You can also use Wizard’s Locator to get a direct location via GPS. It’s a fun place to check out.